Stunning camelot home that will impress the most selective buyers. 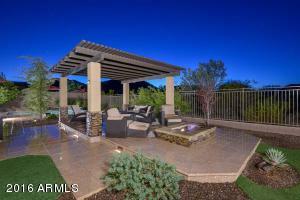 Located in the upscale gated community of canyon's edge at sonoran mountain ranch. You will fall in love from the moment you drive up to this elegant estate. Beautifully landscaped front and back with lush synthetic grass and low maintenance desert accents. The backyard is your own private resort with pool, fire pit, bbq island, putting green, stunning hardscape and beautiful desert view. This 4 bedroom plus a loft and office provides rooms for all. Chef's gourmet kitchen with gas, granite, large island with plenty of storage. Private courtyard w/ fireplace. Tons of parking in the tandem 5 car garage. Inside and out this home has been meticulously maintained. Best home for the money!